With the right homeopathic treatment, you can cure adenoids without surgery and see improvement within 2 weeks! Nature is smarter than us, these glands were put in there for a purpose i.e. to defend us against infections of childhood. Adenoids can swell up due to several reasons and they do so as an indication to alert you of any underlying cause. Instead of understanding & addressing the cause we decide to kill the messenger by surgically removing the adenoids. No one in his right mind would agree to such an approach towards life. Where on earth is such an approach considered prudent & sensible that you kill the bearer of bad news. Children with enlarged adenoids mostly breathe through their mouth because their nose is blocked. Mouth breathing occurs mostly at night, but may be present during the day. 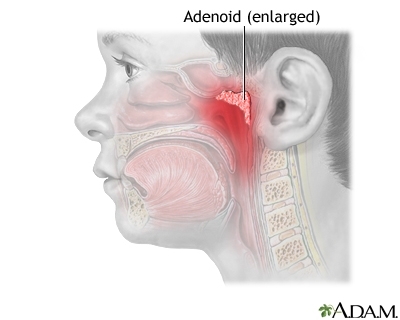 The adenoids are lymph tissue that sit in your upper airway between your nose and the back of your throat. They are similar to the tonsils. Enlarged adenoids means this tissue is swollen. In allopathic medicine there is no cure except surgery. Homeopathy on the other hand can cure adenoids without surgery, in most if not all cases. The adenoids help the body prevent or fight infections by removing bacteria and germs. Children with enlarged adenoids may also have more frequent ear infections and do poorly in academics & may lack achieving the intelligence they would have otherwise. If left untreated, due to constant mouth breathing caused by enlarged adenoids, the natural face contours of the child can be deformed permanently by getting an elongated face, thickened lips etc. Such a deformity is called “Adenoid Facies”. A picture of Adenoid Face appears below. This is totally avoidable with proper treatment at the right time. The adenoids cannot be seen by looking in the mouth directly. The health care provider can see them by using a special mirror in the mouth your mouth or by inserting a flexible tube (called an endoscope) placed through the nose. There are many remedies in homeopathy which can be safely used to cure this condition permanently and avoid surgery. The adenoids & tonsils are in the body to act as the first line of defence against infections. We are not smarter than nature, hence it makes no sense to remove these glands at the first onset of the problem. Try the alternatives first and if you don’t get the desired results within 2-3 months, you can opt for surgery as the last option. Not going for the surgery as the first thing. With the right homeopathic treatment, the results start showing within 2 weeks and within 8 weeks 80% cure can be expected. 3. Read the instructions carefully and use the SRF. Make sure you read the instructions. We will select the remedy and manage your case FREE for one month (or more in some cases). You can buy the homeopathic remedy from anywhere you like e.g. your local health store or internet. If you like the results of the consultation you can pay us after the month (or more in some cases) and continue with the treatment in the same way i.e. pay after every month. You will have access to the Member Portal to manage your case easily through it. We have made it very easy to get healthy, all you have to do is try one of the above options.